UNITED NATIONS, Sept 30 (APP): Pakistani Ambassador Maleeha Lodhi met president of the U.N. Security Council, Gerard van Bohemen of New Zealand on Thursday and urged him to informally brief the 15-member body on her country’s dangerous escalation in tension resulting from unprovoked firing by Indian troops across the Line-of-Control (LoC) in Azad Kashmir. Urgent steps were need to avert a full-blown crisis, she said. Ambassador Lodhi soon after receiving reports of Indian aggressive actions in the disputed region of Kashmir, she met the President of the Security Council, which deals with issues of war and peace, and briefed him about the latest developments that have heightened tensions between the nuclear-armed neighbours. Indian military officials claimed that their commandos crossed into Azad Kashmir on Thursday and killed what they called “suspected militants” preparing to infiltrate India and carry out attacks on major cities, but Pakistan denied that any targeted strikes had taken place across the LoC. Two Pakistani soldiers were martyred in exchanges of fire, raising the possibility of military escalation between the two countries that could wreck a 2003 Kashmir ceasefire. Van Bohemen, the council president for September, said he told the body on Thursday that the Pakistani envoy had visited him to raise concerns about the situation with India. “I briefed the council on her approach,” he said. She said there had already been “ominous signs of unusual movement” along the border with movements of troops and tanks and credible reports of Indian evacuations of some areas. Speaking on al-Jazeera television, the Pakistani envoy said India was trying to divert International attention from the war crimes it was committing in occupied Kashmir where more than 107 innocent Kashmiris have been killed by Indian forces recently, thousands wounded, with 150 blinded by the use of deadly pellet guns. “So India is trying to provoke a crisis with Pakistan in the hope that it can divert attention and calm domestic opinion, which is increasingly questioning the Indian government about its role in Kashmir. “My country has exercised maximum restraint in the face of what happened in the early hours of Thursday what we saw was cross-border shelling by mortar fire as well as small arms fire,” She added. Replying to a question, she said Prime Minister Muhammad Nawaz Sharif had told India several times that Pakistan was ready to formalize the 2003 ceasefire into a formal agreement, but New Delhi has declined to respond. She said the United Nations’ members of the Security Council must live up to their long-standing obligations to ensure that the Kashmiri people were given the right to self-determination through a UN-supervised plebiscite. “We would like the International community—we would like the United Nations—to play a role in diffusing tensions and not wait for a full blown crisis to occur before trying to avert it, and I think India’s effort to provoke a crisis is something that the International community should respond to quickly and with urgency,” she said. 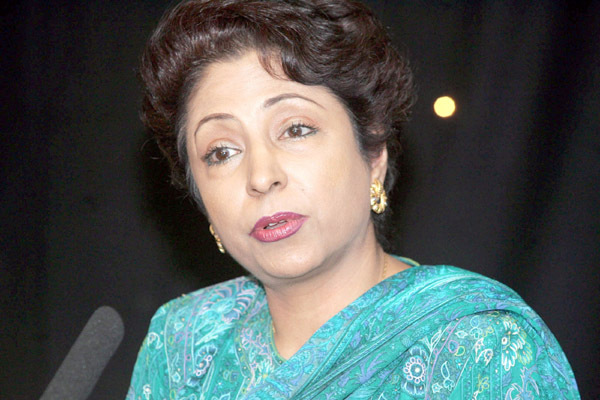 “As far as my country is concerned, we are confident we know what we need to do to respond should India up the ante,” Ambassador Lodhi said. “We do believe that two nuclear neighbours should try to resolve their differences peacefully through dialogue, but it is India that has suspended the dialogue. It refuses to talk. All it is doing is talking in the language of conflict and war and that is not something Pakistan wants, but at the same time Pakistan wants to ensure that the people of Kashmir were granted their UN-promised plebiscite so that they are able to determine their destiny,” she said.